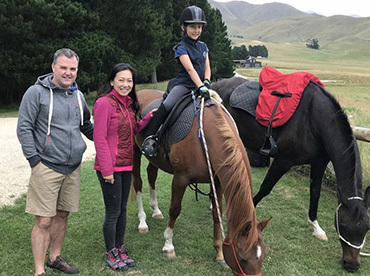 Horse Riding lessons are taken by our neighbour Madeline, she has a horse arena where she can teach guests how to ride a horse, it does not matter at what level the person is at, Madeline will teach to the ability of the person. Our neighbour Mike can take guests to the best fishing spots with a choice of our local rivers and lakes. He provides all the gear that is needed. We have an on-call Massage Therapist who comes to the premises to massage our guests. If you book the geodesic dome tents she can massage the guest in the tent with the fire going for warmth. Otherwise, we have a dedicated massage room in the lodge. Nestled into the hillside of the farm, you will enjoy five-star comfort, with a beautiful seven-hectare forest as a backdrop and the most stunning views of the Waitaki Valley and surrounding mountains. There are two outdoor dining areas, plus a fire pit. And for a completely amazing experience, there are four outdoor-baths in the forest; two with magnificent views down into the valley and the other two strategically positioned in a clearing perfect for viewing the Milky Way! We are close to the Alps to Ocean Cycle Trail which runs from NZ's highest mountain Aoraki/Mt Cook to the historic town of Oamaru on the East Coast. We have 2 new geodesic dome tents, 2 lotus belle tents and 2 trendy cabins. Each tent offers a king or super-king sized bed, some can be split to make 2 single beds. All tents and cabins are luxuriously furnished and have private decks with seating to take in our fabulous views. We also provide a purpose built off-grid lodge with shared kitchen, dining and bathroom facilities, thoughtfully designed using natural timbers with a pot-belly stove for warmth. Our place is good for couples, families, or larger groups of up to 18 people. 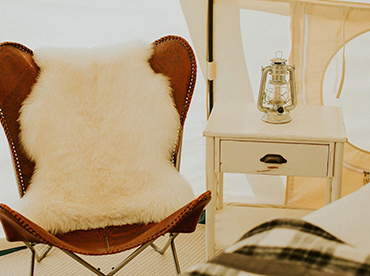 You will experience the luxury of glamping on a working beef cattle farm, you will love; the space, tranquility, super comfy beds, the experience of camping without the discomforts! Our guests love the comfy beds with warm snugly duvets, and the way the tents are beautifully furnished, plus the home-cooked meals in the lodge with the pot-belly stove keeping everyone warm on a chilly night. We have 2 trendy cabins available at a cosy 10 square metres each, with a loft for a 3rd person (or two children). - Private decks with fabulous views. Shared kitchen, dining and bathroom facilities. Four outdoor baths (2 sets of 2) in the pine forest with screening for privacy and magnificent views. - Private balcony with fabulous views. We have 2 new geodesic dome tents - new to New Zealand! These tents have a clear window in the front so that guests can lie in bed and take in the incredible views. Each also features a small wood fire to keep you warm on cold nights. Wood fires in tents Shared kitchen, dining and bathroom facilities Four outdoor baths (2 sets of 2) in the forest with screening for privacy and magnificent views. There is a shared kitchen and home-cooked meals in the lodge available, with the pot-belly stove keeping everyone warm on a chilly night. Patrick and Amber Tyrrell are proud to be your hosts and the owners of Valley Views Glamping. Patrick grew up on a farm in the Eastern Cape of South Africa. Amber grew up on a farm just down the road from Valley Views, right here in the Waitaki Valley. The two met during their overseas adventures, while working on a Moshav in the desert in Israel. After further travels they married and settled in New Zealand.